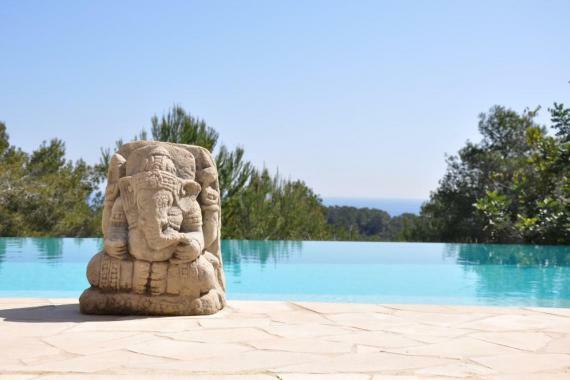 Villa Tamara is a spacious vacation villa near Cap Martinet, close to Jesus, Ibiza-town and Talamanca beach. This lovely vacation villa comprises two floors. On the top floor (street level) there is a living/dining area with fire place, a modern fully equipped kitchen and the master bedroom with double bed (180 x 200) with en suite bathroom. Living area and bedroom have access to the terrace on this floor with wonderful sea view. On pool level there are 2 double bedrooms (bed 180x200) and 1 twin bedroom beds 90x180). There are 2 bathrooms, one en suite. All bedrooms have direct access to terrace and pool. Further on this floor a laundry room with washing machine, tumble dryer and another fridge-freezer and a TV room with comfortable sofa and satellite flat screen TV. Villa Tamara lies in a well-tended garden with large infinity pool (15 x 5) with outdoor shower and stunning sea view. There are several terraces with comfortable outdoor furniture, 3 hammocks, 2 Balinese beds and a dining table for 8. There is a sauna for 5 persons. Vacation villa Tamara is for rent near Cap Martinet in south Ibiza (Spain). Jesus: 8 minutes. Ibiza-town: 10 minutes. Supermarket, restaurants: 5 minutes. Talamanca beach 5 minutes. Airport: 15 km. Maid service once a week. Change of bed and bath linen once a week. Garden and pool maintenance once a week.